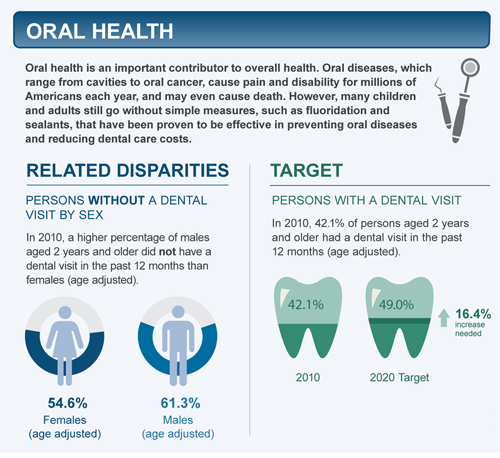 Oral health is an important contributor to overall health. Oral diseases, which range from cavities to oral cancer, cause pain and disability for millions of Americans each year, and may even cause death. However, many children and adults still go without simple measures, such as fluoridation and sealants, that have been proven effective in preventing oral diseases and reducing dental care costs. In 2010, a higher percentage of males aged 2 years and older did not have a dental visit in the past 12 months than females (age adjusted). In 2010, 42.1% of persons aged 2 years and older had a dental visit in the past 12 months (age adjusted).